ROLI och FXpansion lanserar Cypher2 som är den mest sofistikerade MPE-synten till dags datum. Cypher2 innehåller över 1300 ljud varav 500 är MPE-optimerade. Cypher2 går att köpa på fxpansion.com och just nu till ett specialpris för befintliga Seaboard- och Blocks-användare. Cypher2 Player, som är en ”lite” version av Cypher2, skeppas nu med alla Blocks och Seaboard och kommer även vara tillgängligt för redan befintliga ägare. Cypher2, ROLI’s most exciting new software product for 2018, is now live. 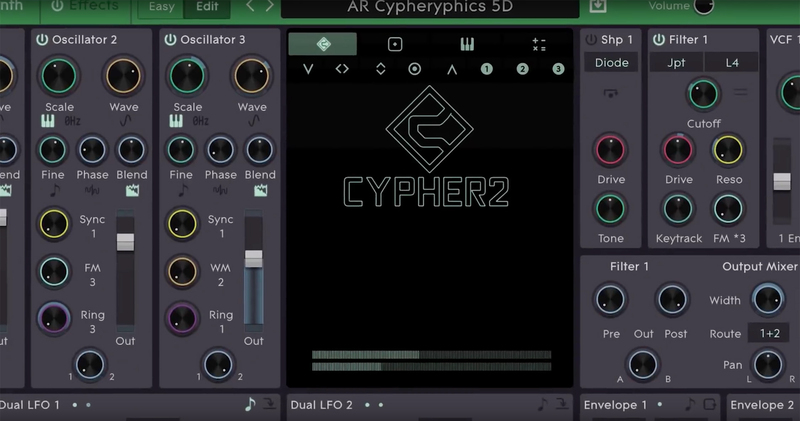 Years in the making, Cypher2 is a cutting-edge synthesizer and sound design tool. Cypher2 is designed for deep sonic exploration and expressive performances. It features a vast range of sound design tools and over 1300 sounds, including 500 MPE-optimised presets. Experience an unparalleled level of expression through analogue-modelled oscillators, waveshaping and thru-zero FM. Our signature TransMod modulation system, now upgraded for Cypher2, ensures that every session with this premium synthesizer is a sound design adventure. Cypher2 Player, a ”lite” version of Cypher2, will be bundled with all Blocks and Seaboards to current and future creators. It is the single most valuable component of the software bundle. This is the most sophisticated MPE synthesizer ever made, and an important addition to the growing landscape of MPE synthesizers. – A far more intuitive TransMod with three times as many Mod Slots, dozens of new sources and all manner of real-time monitoring to help you navigate the system. – A fully scalable vector-based GUI with color themes for every taste and lighting environment. – The same circuit modelled filters, plus four brand new models. – The most capable sequencer / arpeggiator we’ve ever shipped. – Switchable tri / sin core oscillators with additional audio-rate modulation paths for more complex, dynamic timbres. – New polyphonic distortion and waveshaping modules including wavefolders, all modulatable in real time. – Spline Curves, Maths Modules, X/Y, slew generators, keyzones and a raft of Euro-inspired modulation tweaks. – LFOs with multiple phase outputs and sub-oscillators, envelopes with four simultaneous curves and dual looping ramps. – A poly audio routing subsystem that lets you apply different FX mixes to different oscillators, different parts of the keyboard, different bits of the frequency spectrum or even the attack and release phase of the same sound. – Assignable, flexible MPE controllers to enable full expressive playing from ROLI Seaboards, BLOCKs and MPE-compatible instruments from other vendors.